For years I’d hoped that OverDrive’s e-book-and-multimedia app for libraries would do all-text bolding. So many library fans have their own wish lists of accessibility features, and full bolding led mine since I cherish an extra-high-contrast view for reading e-books, even on LCD displays. 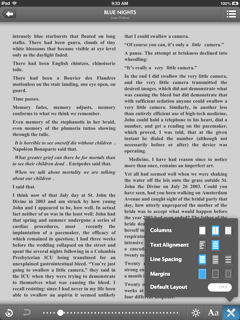 Earlier in 2012 OverDrive obliged with optional bold fonts for the Android version, and now it is out with similar goodies for iPads, iPhones and Touches—in fact, not just all-text bold but also multi-column capability. Among the other upgrades in the new iOS version is an “in-app browser for OverDrive-powered sites, which, although not quite Kindle-seamless, means you can go from a Web view back to your bookshelf with one effortless tap. Unfortunately, the new iOS version does not let me vary the line spacing as much as I’d like, and it would be wonderful if OverDrive and other library app providers, including the ever-innovative Douglas County Libraries, offered text to speech capabilities for books allowing this. In all library apps, I’d also welcome the ability to close gaps between paragraphs in books, using indentation to show the starts of new ones. Still, OverDrive’s new wrinkles are definite progress. Click on the screenshot for a more detailed view of the all-text bolding and multiple column capabilities in action. Is it Time to Stop Making eBooks for Older Kindles? Actually, they allowed Overdrive onto the KF. The app was already in the Appstore.